Anthony John Pierzynski (/pɪərˈzɪnski/; born December 30, 1976) is an American former professional baseball catcher. He played in Major League Baseball (MLB) with the Minnesota Twins (1998–2003), San Francisco Giants (2004), Chicago White Sox (2005–2012), Texas Rangers (2013), Boston Red Sox (2014), St. Louis Cardinals (2014) and Atlanta Braves (2015–2016). Pierzynski is one of only ten catchers in Major League history to reach 2,000 hits in his career. Pierzynski is known for having a strong and colorful personality, a fact he acknowledges. During his turn at the microphone following the White Sox victory parade in 2005, he thanked team personnel "for putting up with me." Former White Sox manager Ozzie Guillén summed up the situation as, "If you play against him, you hate him. If you play with him, you hate him a little less." Guillén also acknowledged Pierzynski's value to the club, despite being relatively high-maintenance: "A.J. 's been great for me. He's worth the work because he always shows up for you." Pierzynski was born on December 30, 1976, in Bridgehampton, New York. He attended Dr. Phillips High School in Orlando, Florida, where he won All-State honors in baseball. Future Major Leaguer Johnny Damon was one of Pierzynski's high school teammates. Pierzynski graduated from high school in 1994 and signed a letter of intent to play baseball at the University of Tennessee. He was also selected by the Minnesota Twins in the third round (71st overall) of that year's MLB Draft and chose to sign with the ballclub on June 9. He began his minor league career with the Gulf Coast League Twins and spent the next four years playing for the minor-league Elizabethton Twins, Fort Wayne Wizards, Fort Myers Miracle, New Britain Rock Cats, and Salt Lake Buzz. After four years in the Twins organization, he was called up to the major league team, and made his debut on September 9, 1998, when he was 21 years old. He then spent the next five seasons, through the 2003 season, with Minnesota, though he was not a regular starter until 2001. From 1998-2000, he appeared in just 49 games for the Twins. In 2002, he made the American League All-Star Team as a reserve catcher. In the 2002 American League Division Series, Pierzynski hit an important home run in the ninth inning of the final game, in which the Twins clinched the series. In 2003, Pierzynski reached a .312 batting average, a career high. After the 2003 season, the Twins traded Pierzynski to the San Francisco Giants for Joe Nathan, Francisco Liriano, and Boof Bonser. With the Giants he hit .272 with 11 home runs and 77 RBIs. He spent one season in San Francisco before being non-tendered. 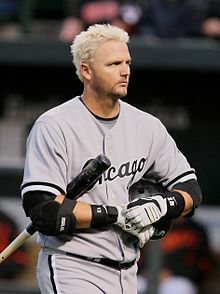 Pierzynski was signed as a free agent by the Chicago White Sox on January 6, 2005. When he signed with the White Sox, the San Francisco Chronicle ran a story claiming that the catcher had kneed Giants trainer Stan Conte in the groin during a spring training game in 2004. Although the incident allegedly happened during the game, it went unreported for nearly a year in the press. Pierzynski has disputed the allegations publicly. "Don't you think if something like that happened, in spring training, you would have heard about it? I would have gotten in some sort of trouble?" Pierzynski would hit 18 home runs, a new career high, with his most memorable home run of the regular season coming on June 18, 2005 against the Los Angeles Dodgers in the bottom of the ninth to walk-off a 5-3 win. It was also memorable as both teams were wearing their 1959 throwback jerseys to commemorate their meeting in the 1959 World Series. Pierzynski would help the White Sox go wire-to-wire in his first season with the team, winning the AL Central on September 29, 2005 in a win against the Detroit Tigers. However, Pierzynski's biggest contributions would come during the White Sox 2005 playoff run. In the 2005 playoffs, Pierzynski was a major player for the White Sox. In Game 1 of the ALDS against the defending champion Red Sox, Pierzynski would start the White Sox off strong with a 3-run homer in the first inning off of Matt Clement. He would add a second home run in the bottom of the 8th off Bronson Arroyo to help lead the White Sox to a blistering 14-2 win. Pierzysnki finished the game 3-3 with 4 RBIs. Pierzynski also hit a double and scored an insurance run in the top of the 9th inning as the White Sox defeated the Red Sox 5-3 to clinch the series and move on to the ALCS. Perhaps Pierzynki's biggest, and most well-known play, came in Game 2 of the ALCS against the then Los Angeles Angels of Anaheim. Down 0-1 in the series and the game tied at 1-1 in the bottom of the 9th inning, Pierzynski famously struck out on a low ball in the dirt from Kelvim Escobar. Thinking they had ended the inning, the Angels proceeded to walk off of the field; however, noting that home plate umpire Doug Eddings had not made the out call, Pierzynski ran down the line to first base and was called safe. Angels catcher Josh Paul and manager Mike Scioscia argued with Eddings but the call stood and Pierzynski was replaced by Pablo Ozuna who promptly stole second base. Joe Crede would end the game on a walk-off double to tie the series at 1-1. The White Sox did not lose again, winning the next 3 games in Anaheim to advance to their first World Series since 1959. The White Sox would then sweep the Houston Astros to win their first championship in 88 years, giving Pierzynksi his first ring. Pierzynski batted .262 with 3 home runs and 9 RBI, catching all 11 games for the White Sox during their championship run. In 2006, Pierzynski was named one of the five American League players in the All-Star Final Vote. Soon afterwards the Chicago White Sox organization began an election campaign using the slogan "Punch A.J." Pierzynski received 3.6 million votes, the most votes in the American League, subsequently sending him to his second All-Star appearance. The "Punch A.J." campaign was inspired by an incident on May 20, 2006 between Pierzynski and Chicago Cubs catcher Michael Barrett. After a fly ball out, Pierzynski tagged up at third base and tried to score on the throw. After a collision at home, where Pierzynski knocked Barrett from his feet, Pierzynski slapped home plate with his hand. After getting up, Barrett grabbed Pierzynski and punched him in the face. A bench-clearing brawl ensued, and Pierzynski, Barrett, White Sox outfielder Brian Anderson and Cubs first baseman John Mabry were ejected. When play finally resumed, outfielder Scott Podsednik promptly got on base, loading the bases up, and second baseman Tadahito Iguchi cleared them with a grand-slam. The White Sox won the game, 7–0. Michael Barrett was suspended for 10 games, while Brian Anderson was suspended for five, and Pierzynski was fined. Pierzynski caught Mark Buehrle's no-hitter on April 18, 2007, but not his perfect game on July 23, 2009. He caught Philip Humber's perfect game on April 21, 2012 against the Seattle Mariners at Safeco Field, as well. On May 28, 2007, in a game versus the Minnesota Twins, Pierzynski twice ran down the first base line with his feet on the inside of the base, possibly nipping Twins first baseman Justin Morneau with his spikes. Twins manager Ron Gardenhire was furious with the umpires, which resulted in a long tirade. However, he was not ejected. Pierzynski denied any attempt to step on Morneau. Pierzynski holds the AL record for consecutive errorless chances with 962, breaking Yogi Berra's previous record of 950, set in 1959. Pierzynski agreed to a two-year contract to remain with the White Sox after the 2010 season. On June 13, 2012, Pierzynski was rated the most hated MLB player. In 2012, Pierzynski homered in five consecutive games, tying the franchise record and becoming the sixth player to achieve this feat. His teammate Paul Konerko was the most recent Sox player to achieve this feat in 2011. Pierzynski had a career offensive year, winning a Silver Slugger Award at catcher, his first, while hitting .278/.326/.501 with 27 HR and 77 RBI. Following the 2012 season, Pierzynski agreed to a one-year contract for 2013 with the Texas Rangers worth $7.5 million. He enjoyed a solid year for Texas, hitting .272 with 17 home runs and 70 RBIs in 503 at-bats. On December 3, 2013, Pierzynski agreed to a one-year contract with the Boston Red Sox, pending the completion of a physical examination. The deal became official the next day. On June 4, 2014, Pierzynski was ejected by umpire Quinn Wolcott after a leadoff walk by pitcher Brandon Workman because he asked Wolcott to "give me a new ball. One you can see." This was Pierzynski's ninth career ejection. Pierzynski's offense regressed with Boston as he hit .254/.286/.348 in 256 at-bats. On July 9, 2014, Pierzynski was designated for assignment and Christian Vazquez was promoted from AAA Pawtucket. A sports column in a Boston newspaper cited disgruntled anonymous Red Sox teammates who disliked Pierzynski, blaming him for the team's overall woes. On July 16, the Red Sox officially released Pierzynski. The Red Sox continued a disastrous slide after Pierzynski departed and finished 2014 with a record of 71–91. On July 26, 2014, the St. Louis Cardinals signed Pierzynski to a major league deal. Later that day, he debuted for St. Louis with a 3-for-4 outing and an RBI, helping to defeat the Cubs 6–3. Former Boston teammate John Lackey soon arrived via trade, and Pierzynski caught him for the 19th time in 22 starts in 2014 when he debuted for the Cardinals on August 3. It was the pitcher's 150th career win. Pierzynski's first home run with St. Louis came in a loss to Baltimore on August 8. He hit .244/.295/.305 in 82 at-bats, mostly serving as a backup catcher to Yadier Molina. The Cardinals left Pierzynski off the playoff roster for the NLDS against the Dodgers, but added him for the NLCS against the Giants. Pierzynski and the Atlanta Braves finalized a one-year deal worth $2 million on January 7, 2015. The Braves had intended to use him as a backup catcher and mentor to Christian Bethancourt. However, Bethancourt struggled defensively and was eventually sent down to Gwinnett in the hope that he would improve, forcing Pierzynski into a starting role. On July 18, 2015, in a game against the Chicago Cubs, Pierzynski broke up Jon Lester's no-hit bid in the eighth inning of the Braves' 4–0 loss. On April 27, 2016, Pierzynski recorded his 2,000th career hit off Steven Wright of the Boston Red Sox, becoming the tenth catcher to reach the 2,000 hit mark. He was placed on 15-day DL on August 17, 2016. On March 28, 2017, Pierzynski announced he was retiring. Pierzynski was hired by Fox to be an analyst for the 2011 MLB postseason on the pre-game and postgame show. He joined Fox again for the 2012, 2013, and 2015 postseasons. In 2017 Fox announced he would be a full-time analyst. On December 8, 2005, Pierzynski appeared on TNA Impact!, a professional wrestling television program aired by the professional wrestling promotion Total Nonstop Action Wrestling. Accompanied by White Sox strength trainer Dale Torborg, Pierzynski presented TNA wrestlers A.J. Styles, Chris Sabin and Sonjay Dutt with memorabilia from the 2005 World Series. At the ceremony, an incident was staged to include Pierzynski in a controversy with the wrestlers. Pierzynski then made his professional wrestling managerial debut at TNA Turning Point 2005 on December 11, 2005, accompanying Torborg, Sabin and Dutt to ringside for their match against the Diamonds in the Rough. On October 10, 2006, Pierzynski appeared on ESPN2's Cold Pizza, wearing the X-Division Championship belt,[clarification needed] and challenged WWE Champion John Cena, who was also a guest that morning, to a Title vs. Title steel cage match whenever Cena wanted to have it. Cena responded asking if Pierzynski got his championship belt out of a gumball machine outside. Pierzynski returned to TNA in January 2007, when he and Torborg confronted Lance Hoyt. At Against All Odds 2007 Pierzynszki was in Torborg's corner when he was defeated by Hoyt, who had David Eckstein in his corner. On the September 7, 2009 edition of WWE Raw, Pierzynski made his first appearance on WWE television, replacing Chris Jericho in a game show called The Price is Raw while Bob Barker was hosting. Pierzynski is married to Lisa Pierzynski. The couple has two children, Ava and Austin. ^ a b Cunningham, Michael (April 28, 2016). "Braves' Pierzynski is 10th catcher with 2,000 hits". Atlanta Journal-Constitution. Retrieved April 28, 2016. ^ "Love him or hate him, you have to respect A.J. Pierzynski - ESPN The Magazine". Sports.espn.go.com. Retrieved April 1, 2013. ^ "Time To Get Over Your A.J. Pierzynski Hatred". sportsmockery.com. Retrieved March 2, 2015. ^ a b "A.J. Pierzynski," Player File, Biography, Chicago White Sox, official website. Retrieved May 18, 2007. ^ a b "A.J. Pierzynski," Transactions, Baseball-reference.com, Retrieved May 18, 2007. ^ "A.J. Pierzynski," Career stats, Chicago White Sox, official website. Retrieved May 18, 2007. ^ "Giants give up Nathan in deal for catcher". ESPN.com. ^ Jenkins, Bruce (January 15, 2005). "Ballplayers still getting their edge". San Francisco Chronicle. Retrieved October 23, 2008. ^ "Bottom line: A.J. 's a gamer". ESPN.com. Retrieved October 21, 2008. ^ "Los Angeles Dodgers at Chicago White Sox Box Score, June 18, 2005". Retrieved February 24, 2019. ^ "2005 American League Division Series (ALDS) Game 1, Boston Red Sox at Chicago White Sox, October 4, 2005". Retrieved February 24, 2019. ^ "2005 American League Division Series (ALDS) Game 3, Chicago White Sox at Boston Red Sox, October 7, 2005". Retrieved February 24, 2019. ^ Newman, Mark (July 6, 2006). "Nomar, A.J. named Final Vote winners". MLB.com. Retrieved July 10, 2014. ^ "Cubs' Barrett slugs Pierzynski, leads to melee". ESPN. Retrieved October 23, 2008. ^ Associated Press (May 20, 2006). "Cubs' tempers boil, bats fizzle as ChiSox win". ESPN.com. ^ Associated Press (May 26, 2006). "Barrett suspended 10 games for igniting brawl". ESPN.com. ^ "Retrosheet Boxscore: Chicago White Sox 6, Texas Rangers 0". Retrosheet.org. April 18, 2007. Retrieved April 1, 2013. ^ "Chicago White Sox vs. Seattle Mariners - Recap - April 21, 2012 - ESPN". Scores.espn.go.com. April 21, 2012. Retrieved April 1, 2013. ^ "Twins upset about Pierzynski's play". mlb.com. Retrieved May 29, 2007. ^ "White Sox, A.J. Pierzynski agree on two-year extension". MLB.com. Archived from the original on March 25, 2012. Retrieved October 21, 2008. ^ "Pierzynski, White Sox renew partnership | whitesox.com: News". Chicago.whitesox.mlb.com. June 19, 2012. Archived from the original on January 9, 2011. Retrieved April 1, 2013. ^ "Pierzynski re-signs with White Sox for 2 years". Sports.espn.go.com. December 3, 2010. Retrieved April 1, 2013. ^ Calcaterra, Craig (June 13, 2012). "Men's Journal survey: A.J. Pierzynski is baseball's most hated player. Philly has the most obnoxious fans". HardballTalk. ^ "MLB.com Gameday | MLB.com: Gameday". Mlb.mlb.com. Retrieved April 1, 2013. ^ "Rangers, catcher A.J. Pierzynski officially agree to one-year, $7.5 million deal | texasrangers.com: News". Texas.rangers.mlb.com. Archived from the original on December 30, 2012. Retrieved April 1, 2013. ^ a b "A.J. Pierzynski Statistics and History". Baseball-Reference.com. ^ Browne, Ian (December 3, 2013). "Pierzynski agrees to one-year deal with Red Sox". MLB.com. Retrieved December 3, 2013. ^ Twitter / Ken_Rosenthal: Pierzynski passed physical with #RedSox, one-year deal is official. ^ Castrovince, Anthony (June 26, 2014). "Ejections are actually on the rise this season". MLB.com. Retrieved July 11, 2014. ^ Browne, Ian (June 5, 2014). "Pierzynski tossed by plate umpire in series finale". MLB.com. Retrieved July 11, 2014. ^ Perry, Phil (July 9, 2014). "Reports: Sox designate Pierzynski for assignment". Comcast SportsNet New England. Archived from the original on July 11, 2014. Retrieved July 9, 2014. ^ Bradford, Rob (July 10, 2014). "The A.J. Pierzynski Problem was Worse than Anybody Could Have Imagined". WEEI-FM. Retrieved July 10, 2014. ^ Speier, Alex. "Red Sox release A.J. Pierzynski". Retrieved July 17, 2014. ^ "Cardinals sign veteran catcher A.J. Pierzynski". ESPN.com. Associated Press. July 26, 2014. Retrieved July 27, 2014. ^ "A.J. Pierzynski has 3 hits in debut to help Cardinals break 4-game skid". ESPN.com. Associated Press. July 26, 2014. Retrieved July 27, 2014. ^ Langosch, Jenifer (August 3, 2014). "Cards rally behind Lackey's debut to stun Brewers". MLB.com. Retrieved August 4, 2014. ^ Boarman, John (August 8, 2014). "A. J. Pierzynski hits first home run with St. Louis, Cardinals lose to Orioles". Tireball Sports. Retrieved July 26, 2015. ^ "Cards add A.J. Pierzynski for NLCS". ESPN.com. Associated Press. October 10, 2014. Retrieved July 26, 2015. ^ Bowman, Mark (January 8, 2015). "Fiery Pierzynski ready to be mentor in Atlanta". MLB.com. Retrieved January 8, 2015. ^ Moore, Terence (July 1, 2016). "Braves have a manager behind the plate". MLB.com. Retrieved July 1, 2016. ^ Gonzales, Mark (July 19, 2015). "Jon Lester misses no-hitter, but notches 4-0 victory over the Braves". Chicago Tribune. Retrieved July 1, 2016. ^ Cotillo, Chris (March 28, 2017). "A.J. Pierzynski retires - The catcher will be a full-time analyst for FOX this upcoming season". MLB Daily Dish. Retrieved March 29, 2017 – via SB Nation. ^ "Most Popular E-mail Newsletter". USA Today. October 2, 2011. ^ "Fox Sports hires A.J. Pierzynski to be full-time analyst". Chicago Tribune. March 28, 2017. Retrieved October 9, 2017. ^ "Dale Torborg's profile". Online World of Wrestling. Retrieved May 3, 2010. ^ Britton, Tim (April 16, 2014). "A.J. Pierzynski has second father figure in White Sox broadcaster, Hawk Harrelson". Providence Journal. Retrieved July 10, 2014. ^ Dorsey, David (February 18, 2014). "Pierzynski glad to be back". News-Press. Retrieved July 10, 2014. Wikimedia Commons has media related to A.J. Pierzynski.